GSR Journals of Rheumatology is modern day innovative cloud of there search paper, journals, studies, reports etc. In the field of medicine, rheumatology serves an important role. These journals might be very useful for orthopedic professionals employed in the sports medicine and general medicine. It can be used for optimizing workout strategy for sports personals, acquainting new treatment methods, medications, therapies etc. Usually,Rheumatology journals are very scarce to be found for public access, whereas one shall find a large collection of field-specific journals from GSR. 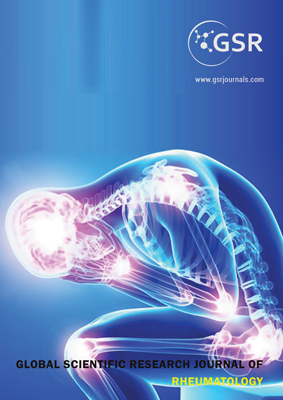 GSR Journals of Rheumatology comes in an open access format such that any individual or corporate shall use the content and data to fuel the development of a service, product or for further research studies. All entries undergo peer review system inorder to rule out possible risk of validity. A dedicated editorial board ensure GSR Journals of Rheumatology, stands far away from the borderline performance and quality. GSR Journals of Rheumatology publishesoriginal research, latest developments, review papers, scientific data,editorials from leading scientists and scholars around the world including but,not limited to the following subjects or relevant fields.